"In animals body size plays an important role in figuring out the amount of energy needed for movement," says Derrick Groom, lead author of the research and a former PhD student in Professor Ken Welch's lab. "We found that larger hummingbirds are more fuel efficient than smaller species, and this may have to do with how smaller hummingbirds need to beat their wings more rapidly than larger species." The goal of the study, which is published in the Proceedings of the Royal Society B, was to explore the link between morphological traits like body mass and wingspan to metabolic rates – the rate at which the birds consume energy. The research also explored how well hummingbirds turned food energy into motion, also called mechanochemical efficiency. "We wanted to explore how efficient hummingbirds of different sizes are in getting motion from glucose and other sugars," says Groom, who recently became a postdoc at the University of Massachusetts Amherst. It goes without saying that larger animals need more energy than smaller animals to move, but it's not a 1 to 1 ratio. In other words, an animal that is 100 times larger doesn't require 100 times more energy to move. "This is something called increasing mechanochemical efficiency," says Welch, a renowned expert on hummingbirds and co-author on the study. In previous studies it's been shown that there's greater efficiency in animals as you increase in size. "Basically, for a given amount of mechanical power produced, it takes less metabolic input to make it happen," notes Welch. Hummingbird metabolism is a marvel of evolutionary engineering. They need an incredible amount of energy to flap their wings 50 times or more per second in order to maintain hovering flight. If they were the size of a human, they would consume energy at a rate more than 10 times that of an Olympic marathon runner. Past research done in Welch's lab has even found that they're equally adept at burning both glucose and fructose, which are the individual components of sugar – a unique trait other vertebrates cannot achieve. While the scaling of efficiency has been studied in some land animals and insects in the past, this is the first time it's been measured in birds. But understanding how body size determines how much energy is needed for flight is technically very difficult since most birds fly straight. 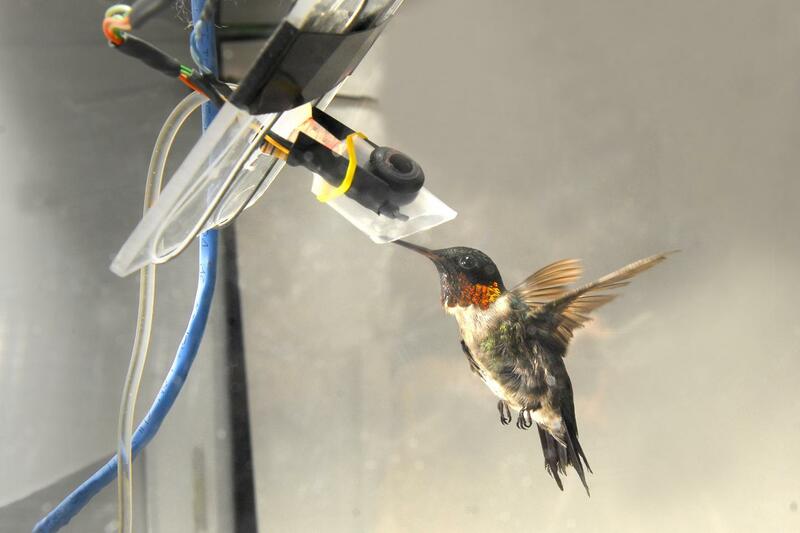 Fortunately hummingbirds use hovering flight, making it easy to measure metabolic rates with available equipment. For the study data from 25 species of hummingbirds ranging in size from three to 10 grams were compared. To gather data for some species, Groom trained them to eat from feeders where they would breathe into respirometry equipment that could measure oxygen consumption and CO2 production. The research raises some interesting questions. For one, it could help explain why certain species of hummingbirds are found in particular locations. The scaling of efficiency may explain why larger hummingbirds are found at higher elevations because they require less food in order to sustain hovering in the less dense, oxygen poor air, notes Welch. It may also help explain why the largest hummingbirds are only so big, which could come down to understanding the efficiency at which hummingbirds can produce mechanical power and how much is needed. "As you scale up, more and more power is needed and the muscular-skeletal structure that all animals are built with just can't rise to the challenge," he says. The same could apply for hummingbirds on the opposite end of the spectrum. The smallest species are no smaller than 2 to 2.5 grams, and the reason could be that mechanical efficiency depends on a minimum size. "Operating your muscles that fast or faster just isn't practical from an energetic standpoint," adds Welch. The research received funding from the Natural Sciences and Engineering Council of Canada, the American Museum of Natural History, National Science Foundation and a Research Infrastructure Grant from the Ontario Research Fund.